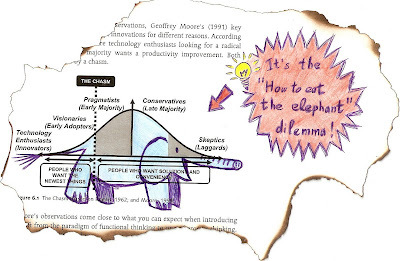 How to Eat the Elephant of Organizational Change? There is always a moment when the work ahead seems so massive that you don’t know where and how to start. Funny enough this feeling always overwhelms me at exactly at the same moment: once I decided for myself what will (and will not) change and how this will impact the organization. Those moments are paralyzing and as it happens, the only way out is through a smart path of deliverables. Every project manager knows that the way to eat the elephant is to chunk the assignment into workable pieces, attribute manpower and materials, define the critical path and schedule over time. Then the thinking is over and the execution can start. ‘People need to use this new software to perform their work’. Regular readers of this blog know that I value involvement and psychological safety as the two main elements of any successful organizational change effort. But then still, where is the elephant and how do we chunk it? As I suggest in the above drawing the elephant is hidden in the target population of a change program and it will only surface when you care to listen very carefully. This ‘burning’ insight came to me as I was reviewing the marketing concepts that I claim to be important inside an organization. The chunks of the elephant are actually the same parts of the audience that you encounter while introducing a new product or initiative. In organizational change you can recognize certain patterns such as the change cycle that we all go through whenever our expectations about the way things are get interrupted. The bottom line here is “things will get worse before they get better”. 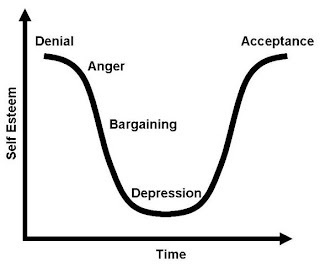 To a greater or al lesser extent we all go through the anxiety, anger, bargaining, depression and acceptance phases. Another thing that is good to know is that different groups go through the cycle at a different point in time and at a different pace. As an earlier mentioned McKinsey research pointed out: anxiety and resistance will surface anyhow, regardless of whether your project is successful or not. Therefore the attitude I choose is one of ‘no time to waste’, i.e. : making sure that the innovators and the early adopters (most of the times this is your own core team and the sponsor of your program) get through that change cycle first and accept the fact that things will change dramatically. Once you have won their minds and their hearts they will help you to attack the next big chunk: the pragmatists and so on. The way to get your target audience moving is not by telling them ‘do something’ but by carefully organizing what we have earlier referred to as ‘diagnostic interventions’. The target audience needs to be guided through their change cycle, but at the same time the work needs to get done. The solution then is to combine both and to provide a series of progressive and smart shaped deliverables that people can shoot at, nicely ordered in the same direction: forward. People make sense of the change as they react to the prototype of your deliverables. Not only will this improve the quality and the accuracy of the deliverables, it will also get their minds in motion and their noses pointed in the direction of the program. The way these deliverables are ordered and paced over time is best determined by the moments of truth of the program, i.e. : in terms of what makes sense to the target audience of your organizational change effort. Some final notes for those of you who would conclude that you can just throw about anything at people’s heads to provoke a reaction. The point of organizational change management is that people will only take ownership of the future state if it all makes sense. And sense making is a process that requires time and psychological safety (knowing that it is OK to step out of an old habit and to try something new). So listen, listen and listen because the cause of major setbacks on an organizational change program are most of the times due to going faster than the speed of making sense.